OnPoint Weather is described exactly as it sounds, weather data for any location at any point in time—made possible by creating “virtual” weather stations at your points of interest. 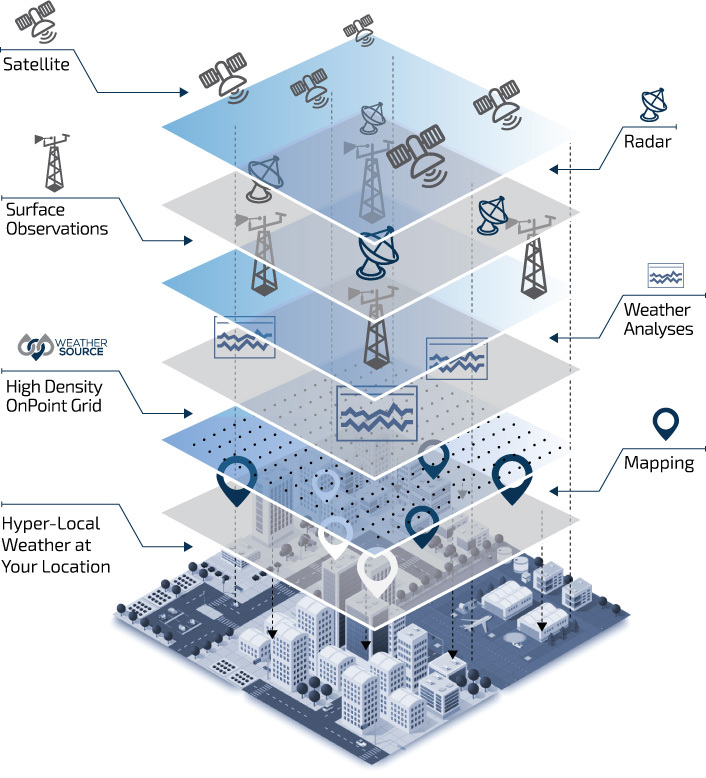 Weather Source ingests all available weather inputs, unifies them under our intelligent code, and resolves issues related to geography, topography, and elevation to deliver accurate predictions at any point on Earth. The OnPoint Weather dataset is a curated continuum of past data from the year 2000 to present, current data, and forecast data of up to 15 days with an enhanced view out to 42 days. Unlike most weather data providers, who simply extend information to your location, Weather Source starts with your exact location then reveals weather and climate insights tailored to your business. Airport observation stations are often too far—up to hundreds of miles—from your location to provide meaningful insight. Up to 25% of airport observation stations routinely report gaps and errors in their data. A meteorological background or significant experience working with weather sensor data is required to decode and prepare airport observation station data for analytics and modeling. Many airport observation stations are located adjacent to an urban center or a large body of water, which can directly affect reported weather. For example, Boston’s Logan International Airport is at sea level, subject to onshore ocean breezes, and located next to a significant urban center, meaning its weather is often markedly different from that at locations less than 1 mile away. A nationwide retailer used OnPoint Weather to quantify the impact of weather data on seasonal product sales. The creation of a predictive model helped the company stock and price inventory according to real-time seasonal changes rather than predetermined dates. A busy hospital used OnPoint Weather to perform regression analysis on emergency room visits to better understand how they are influenced by weather. This allowed the provider to create a predictive model to forecast emergency room footfall traffic, with the end results being optimized staff resources and reduced patient wait times. A logistics company with tight delivery deadlines used OnPoint Weather and OnPoint Analytics to perform regression analysis and identify weather conditions that result in delivery delays. Weather Source then created a model for the company to monitor forecast and climatology data for similar conditions, enabling them to and adjust routes and schedules to prevent future setbacks. A large defense contractor ingested Weather Source’s entire continuum of data, from past to present to forecast, to serve as a single source of truth for its globally distributed employees. This ensured all personnel were operating and modeling with globally uniform data free of discrepancies in spatial and/or temporal resolutions.